Back to Venice, as I have not yet had time to go through all the pictures I took. While we were there, there was various repair and restoration work in hand in St Mark’s Piazza. I guess that is a constant fact of life when you are dealing with a fragile environment and mass scale tourism. Where building facades were being repaired someone had gone to enormous trouble to shield the scaffolding behind large scale images of the facade being repaired. So far, so good. But then, someone else, I assume, had seen a fund raising opportunity to cover that reproduction with an advertisement. 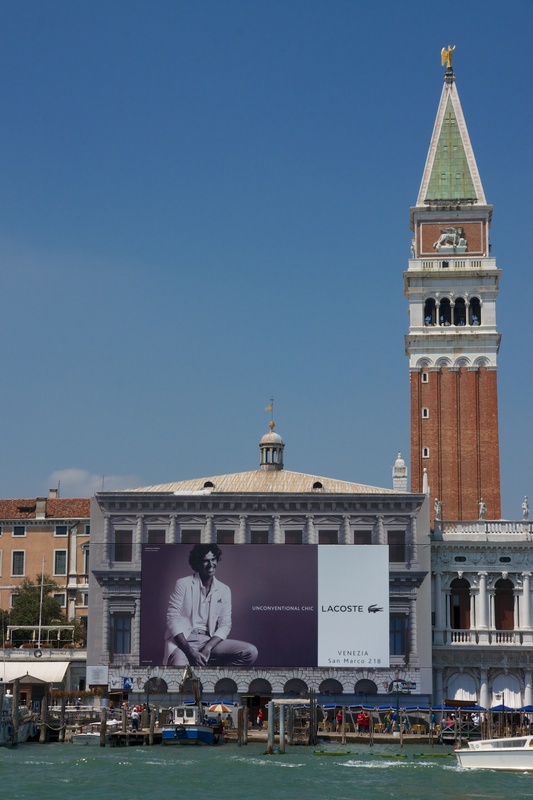 So we have the main approach to St Mark’s Piazza dominated by an advertisement for Lacoste. Why would you do that? If you are Lacoste, why on earth would you want to associate your name with despoiling a world heritage site? I know every public authority is short of money, but this is really appalling. Posted in Architecture, Italy and tagged Italy, Lacoste, St Mark's Square. Bookmark the permalink.